There is a strange man in a bright orange suit with question marks all over it, who frequents my favorite coffee place. 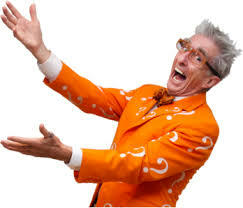 I thought he was crazy*, but it turns out he’s just Matthew Lesko. *He may be crazy, too, but I’m sure he won’t mind me saying that, as all of you are now Googling him and it’s free advertising.